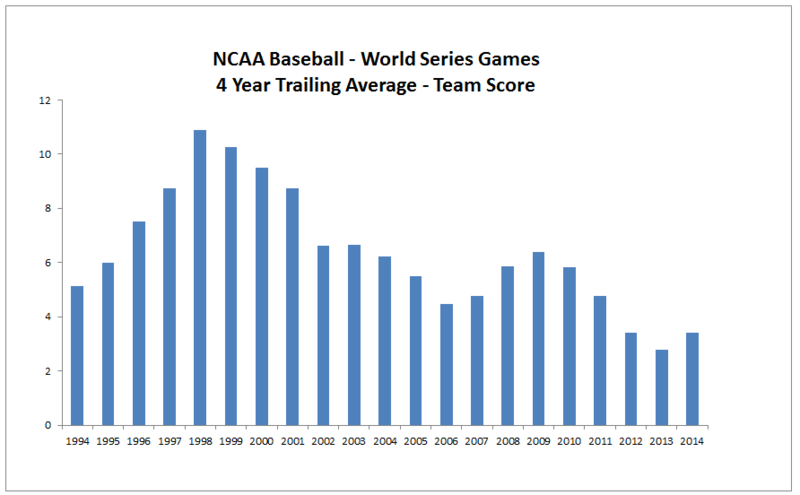 Now that Vanderbilt beat Virginia in the 2014 NCAA World Series, I thought I’d take a snapshot chart of the way BBCOR standards have effected the scores of the College World Series Games over the years with the data from 2014. As well, its interesting to note (although it carries no significant value) the Vanderbilt/Virginia match-up had the highest World Series Game Average Scores since BBCOR has been implemented. With the 2014 NCAA college world series starting this week, the baseball bat community must wonder if the new BBCOR bat standards have had any effect on college baseball offensive production. In 2011, NCAA baseball implemented standards on their baseball bats that controlled the composite and alloy materials ability to produce a trampoline effect on the ball–these regulations, referred to as BBCOR, produced a aluminum alloy or composite bat which mimics the trampoline effect in wood bats. With three years of data behind us, we can be objective about the effect BBCOR has had by comparing the offensive statistics when BBCOR was in place and when it was not. If we can discern any changes in statistics in favor of defense since the introduction of BBCOR maybe we make some broad generalizations about the new standards. Below is a ranked list of stats since 1975. Each year is ranked according to their offensive production. I’ve shown the data since BBCOR was introduced in 2011. Since 1975, the last 3 years of college baseball have seen the three worst years in batting average, runs production, home runs and stolen bases. Since 1975, the last 3 years of college baseball has seen the worst production in batting average (BA), runs scored per game, home runs per game (HR/G) and stolen bases per game (SB/G). Fielding percentage (FP), on the other hand, has never been better and ERA is just about as good as it’s ever been. However, pitchers are not striking batters out more or less than they ever have. So are BBCOR standards ruining the game? If you like offensive production than you might answer yes. Pitchers don’t appear to be getting any better as they are not striking out batters more often–although their ERA is decreasing. And that ERA decrease can be explained by the increase in fielding percentage. Either we are experience an anomaly in amazing college defensive fielding or the baseballs are no longer being hit too hot to handle. The demarcation is so set along the BBCOR standard implementation fault line it leaves no doubt: the BBCOR standards are destroying offensive production. Home runs in 2013 per game are less than half they were at the peak in 1998 (.42 from 1.06). In fact, the average HR/G from 1975 to 2010 was .77 HR/G. 2011, 2012 and 2013 average .473–a 39% drop off in home runs. From a peak in 1998 of 7.12 runs per game to a low in 2013 to 5.27, run production per game dropped a full 25%. The last 3 years have seen 18% less runs than the average of the previous 35 years. Strike out percentages for players are not going up. Contact percentage is staying even. But players are no longer hitting base hits like they used to. Almost 20 points down on average. With BA low and OBP down accordingly, we’ve seen few opportunities to steal bases per game. As a result, there have been 18% fewer bases stolen per game in the last three years then compared to the average of the 35 years previous. You may not be able to argue that the game of College baseball is being ruined by BBCOR standards (who doesn’t like the better chance at a no-no), but you can say that BBCOR standards have hurt offensive production more than any other rule change in the last 4 decades. We can agree, for better or worse, the BBCOR standards change the nature of the game. But do the new BBCOR standards make the NCAA game more or less like the MLB game? We can do the same as we did above and measure the BBCOR standard years against the MLB. The data is a bit mixed. College pitching just isn’t as good as MLB pitching. College Fielding just isn’t as good as MLB fielding. But while the defensive positions of pitching and fielding are better at the MLB level relative to their competition then college players, the MLB is much more of a defensive game even with the implementation of the BBCOR standards. If the goal is to create an NCAA baseball game more in line with the offensive and defensive production of the MLB then BBCOR standards have succeeded in that regard. Pitching and defensive struggles can be fun to watch and in that regard BBCOR standards are not ruining college baseball. However, if the goal of the game is attract more eyeballs and the younger generation, I don’t think making it harder to hit home runs is the way to do it. Bats were clearly getting over effective in the late 90’s (see chart below) and the NCAA had to do something. But the degree to which BBCOR regulations have effected college baseball appears to have been an overdose of regulation. Was there no middle ground? In response to the NCAA BBCOR overreaction, the ball in the NCAA is changing to one with a less protruding seam. This flatter baseball, while not effecting initial bat exit speed, is projected to fly 20 feet further due to less drag effect in the air. It should also, at least in theory, negatively effect a pitchers ability to move pitches. Balls with flatter seams may allow for both better contact and less resistance in flight. If the changes in baseball improve offense enough to recoup the disadvantages BBCOR created will be everyone’s question. A question the data, in about three years from now, should bear out pretty well. When things got out of hand in the late 1990s and 2000s the NCAA had to do something: BBCOR may have gone too far. Being a player that still uses bbcor, the bats are deadened but you can still see the huge differences between wood and bbcor. I think they’ve done a good job.